Wonder what the Emmon's Mittersill Village Chalet might look like all dressed in Winter? Not anymore! All that's needed now are your cross-country and downhill skis! Book now! 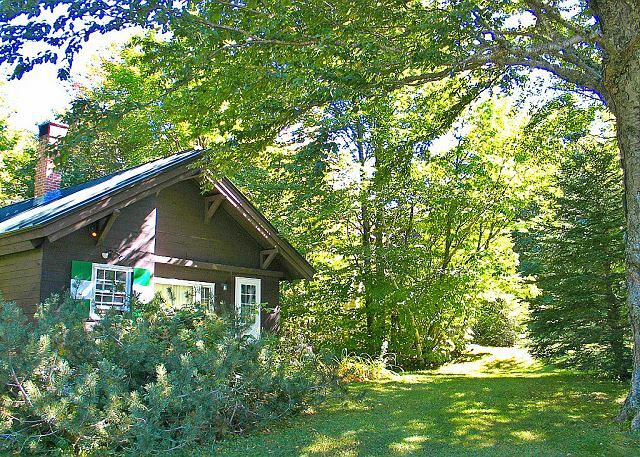 Nestled in the heart of Franconia Notch lies the Emmons Chalet. 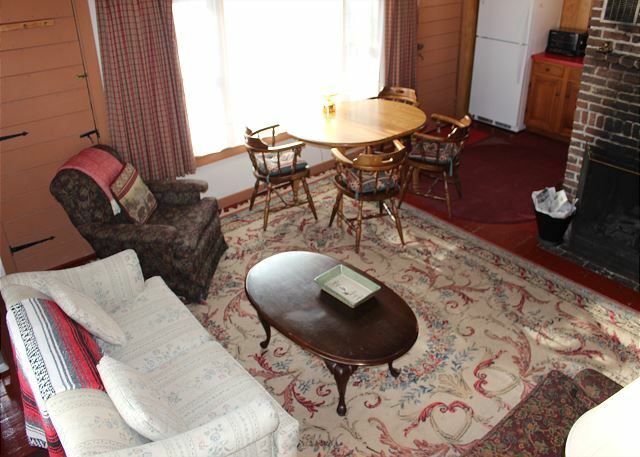 Come visit this 3 bedroom, 1 bath, professionally managed vacation rental at Mittersill Village today! The cute yard and tall trees give you plenty of privacy, while still keeping you close to the main lodge. 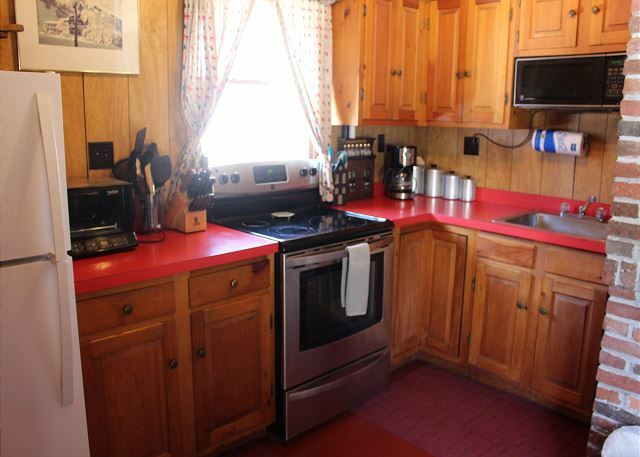 The Chalet's kitchen is cute as a button and well organized to maximize it's smaller design. The furnishings in the home are situated to make the most of the space available. Here we see the living room with adjacent dining area. The wonderful fireplace is the focal point of this cozy chalet; settle into comfort on even the coldest of New Hampshire nights. A view of the living/dining area from the upstairs loft. Bedroom #3, the upstairs loft offers a queen size futon. 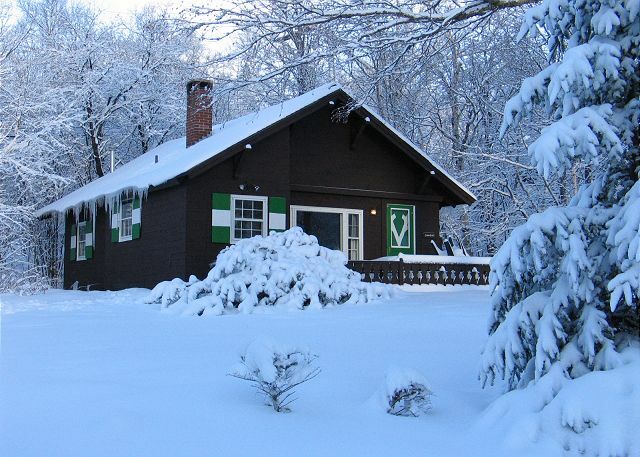 A Professionally Managed Franconia Notch Vacations Mittersill Village Chalet, this cozy mountain chalet offers much in the way of location, warmth, and comfort. 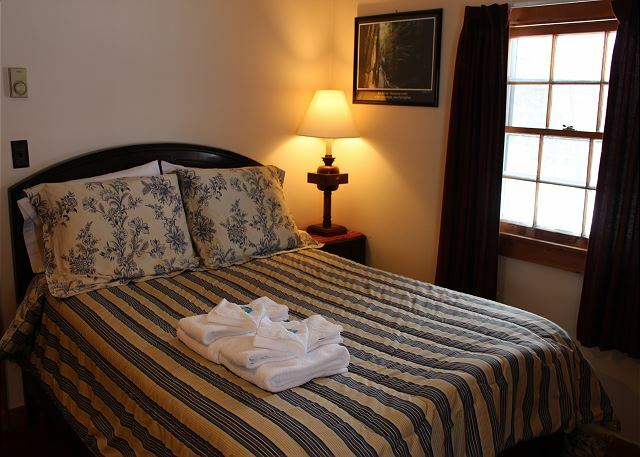 Just perfect for that simple getaway to the Mountains, and only one mile from the ski slopes or hiking trails that Cannon Mountain and Franconia Notch State Park have to offer. 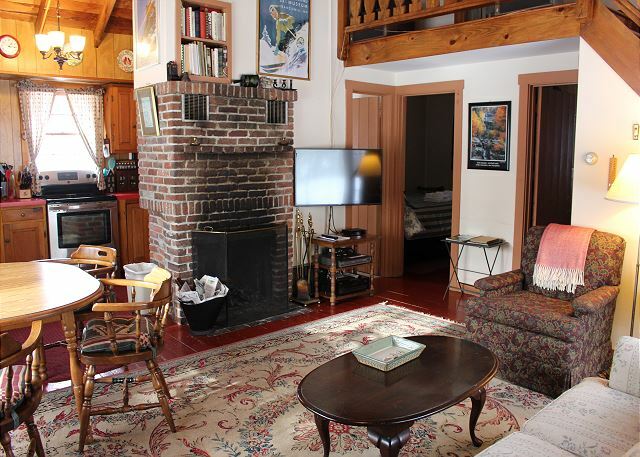 The wood floors and brick fireplace, along with the cable TV with VCR/DVD give the living area all that is needed. The kitchen is modest in size, however functions with the best of them in order to satisfy your food prep needs, while the patio outside supports the BBQ grill to round out the cook's desires. 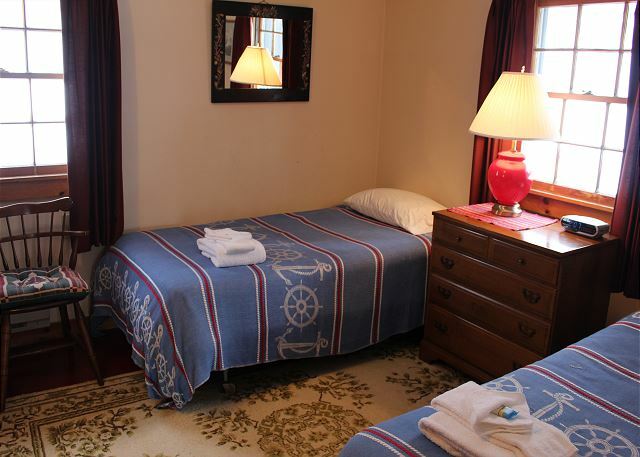 There is one air conditioned bedroom offering comfort for 2 in a double bed, where the second bedroom offers 2 twins. Then there is the newly constructed loft which features a queen size futon sleeper, and room for 2 more. If your family or spouse is looking a place for you all to relax in basic comfort, this is it. It's pet friendly too! This "modern rustic" chalet just awaits your enjoyment. The property photos do not do this property justice. The property is very open and roomy. The layout is great for a family of four. There was room to spare (there is a third sleeping area in the second floor loft area). Living room seating would have been difficult for more than four in my opinion. The property was built in the mid-twentieth century, and much of the original charm remains. There is a new oven and refrigerator, and paint is relatively fresh. Lack of a washer/dryer and dishwasher was not an issue for us, although carpeting in the bathroom was a bit odd! The location was perfect for our needs. It is in a resort setting right at the base of Mittersill and Next to Cannon, but feels like you are in the woods. The Mittersill Baron's pup is a short walk from the house where you can sit at the bar, get snacks and play lots of games. I would definitely recommend this property to families of four, or a group of friends. Go eat at Chef Joe's and Plain Kate's in Franconia, and drive up to the Little Depot in Littleton for some seriously good Brazilian food. The perfect place to start our "empty nest" life. Booking the cabin and picking up the keys was easy. The cabin was perfect for our family vacation. We are looking forward to renting it again in two weeks for our first vacation as empty nesters! This little chalet was in a super location for the activities we had planned with being in the State Park. Plenty of room for 4 adults and a dog. Fireplace worked well and they had plenty of wood available. When we did have a couple of minor issues, Cort was very responsive in assisting us. I would definitely stay here again. Peaceful, relaxing, and reinvigorating all at the same time! Our Little Secret - The Emmon's Chalet! My family and I were looking for accommodations for an Alpine Ski Racing Event and stumbled upon the Emmon's Chalet in the Mittersill Village. What a find, and our little secret! It was absolutely perfect for us because we do like to get a feel for local life when we travel and try to avoid hotels whenever possible! This Chalet will be our first choice for ski events at Cannon in the future, it was a terrific fit for us and nearby the race venue. Franconia Notch Vacations was an on point service that offered us flexibility in our check in and check out times and made our stay easy! It's a great location for kids to ski at Cannon and mittersill. The charlet is perfect size and cozy with everything for vacation. Than is the compliment of compliments Mayer. Thank you while also glad to see you had such an enjoyable experience. We loved it. This was our fist time in the area and the chalet met all of our expecations. This place is a great little home away from home. We greatly enjoyed our time here and would definitely visit again. We have stayed in this chalet two times now and will definitely be back again. It is cozy with plenty of room to fit a family! We love the convenience of the location to Cannon for skiing. Everything was clean and comfortable! This was an terrific place to stay. The owners keep a journal, which dated back to 2002. I took the time to read all the entries, and also made my own. Check out labor day weekend, 2016 in the journal if you're looking for places to hike or eat. Have to say that while driving around, we were lucky enough to see a moose (a beautiful female yearling) and we also saw a bear. We did a lot of hiking on the local trails and enjoyed a lot of good dining in the area. This is a very good location with good access to parks and trails. Bring a blow dryer if you use one. That was the only item missing from the chalet that I would have used. Otherwise, great set up. Extremely quiet area, and dark. I haven't slept that well in years! The house was pleasant and comfortable. There were a few drawbacks The owner is clearly tall, there was no way to reach the food cabinet without a stool (non present.) It would be better if the garbage can was kept in a shed outside the hall as it smelled up the house a bit. Some light fixtures needed checking for safety. If I were staying longer than 5 days I would be unhappy with the lack of a washer dryer, as the Mittersill folks seemed unhappy with chalet renter using their facilities. They were pretty unfriendly in general. The house was sweet and its location, close to the Notch is great. Managers response regarding the Mittersill Resort etc here folks... The Mittersill Resort Lodge has NO affiliation with the chalets surrounding "the resort", and as mentioned here, the management & staff at the lodge tend to be un-welcoming of non-registered guests visiting their establishment. Of course we are glad to see the cleaning ranked as well as it did, and the location worked so well. Regrets on the trash can of course, as 'those things can happen', especially during the warmer days of summer. We will be sure to clean that up while checking on the lights you make mention of. As for access to laundry facilities during stay, if you find the need, knowing we advertise this chalet as not having a washer-dryer, the 2 closest options are both about 15 minutes drive, in either Lincoln or Littleton, which tends to be the case for most all services & goods. Franconia's iconic and then ironic beauty is that it lacks most all such services, naturally. We had a wonderful vacation at Emmon's Chalet. The cabin was well apportioned, clean and comfortable. We arrived after hours but everything was waiting for us in the lock box. We had a great time on the Mt Washington Cog Railway, Flume gorge, and other local attractions. My children enjoyed swimming in Echo Lake only one half mile away. I had no interaction with management because everything went so smooth there was no need to. I would definitely recommend this cottage to everyone and will be looking to stay there again whenever I am in the area. This rental was a GREAT value. :)! Thank you for your kindness Mr. Moquin. Til next time- Thanks again! Cute Chalet with Awesome Convenience! My husband, two boys, and myself had a great time at the Chalet this past weekend! My husband was happy with the fireplace, there was plenty of room to cook in the kitchen, and the boys loved playing in the loft space. We all really liked the fact we were so close to Cannon Mountain to enjoy our last ski trip for the winter season and we can't wait to come back again soon to enjoy the summer! We had a great stay in this cozy chalet. Worth every penny! My husband and I fell in love with this little gem in the White Mountains. Could not have asked for a more beautiful location and the setting lends itself to pure bliss. The chalet is so cozy and incredibly well built- the fireplace kept us plenty warm on the chillier mountain nights. Privacy was essential for us and this chalet has it in abundance. This place holds a very special place in our hearts. We felt completely at home, and we eagerly await our return to this place of charm and incredible beauty!! So so happy a cabin like this exists! Outstanding!! Fully Equipped kitchen. beautiful location. Easy to find. Clean rooms. Another bathroom would have been nice. but still ok. Overall nice home for a short vacation. 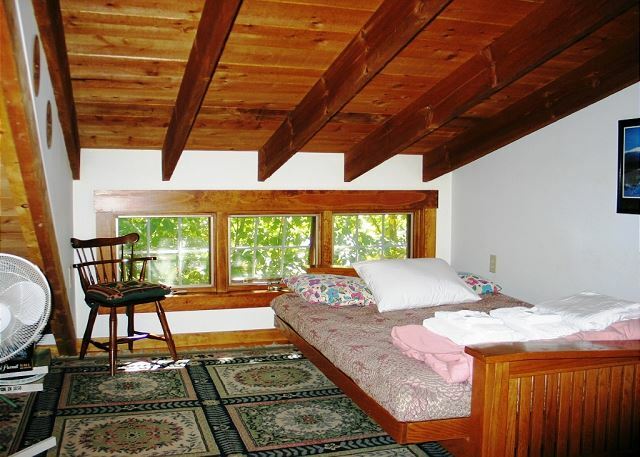 Pleasant cabin, rustic in style, located a short walk from the Mittersill lift at Cannon mountain. Very helpful staff at Franconia Notch vacations. Cort was very accomodating and friendly. We were very happy with our experience! Comfortable, clean and cozy!! Love the fire place! 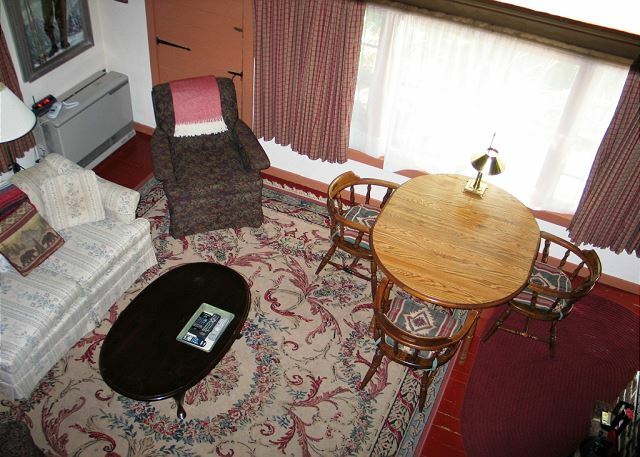 Very nice place in a very convenient location for all the great features of Franconia Notch. Would have enjoyed a view from the chalet. Chalet is older, so limited comfort feature --- but overall it was fine. Cort was a great property manager!! Very nice little cottage - perfect for our family of 4 plus our dog. Definitely would recommend it. This was a great rental to give my family a much needed couple days away. The cottage was clean, well stocked and ready for us by mid-afternoon. Departure procedures were clear and easy.Thanks for a great stay! ;) Thank you again Kirsten! The Emmon's Mittersill Chalet was a great fit for family time. 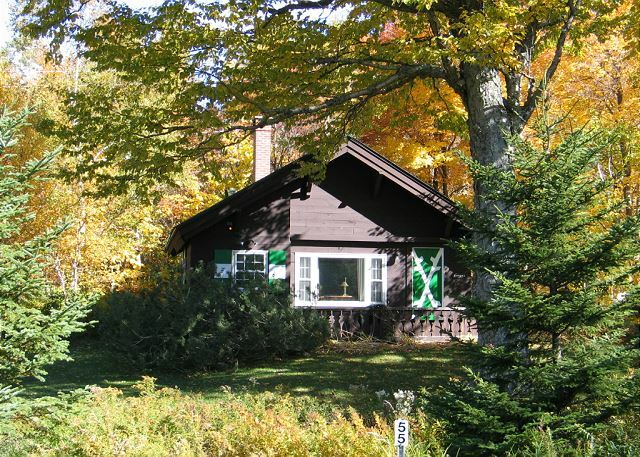 We love the outdoors and the Chalet is located within easy access to many of the activities Franconia Notch has to offer. The only drawback, for us, was that it is located within a resort setting, however, the Chalet itself was great! We stayed in the Emmons Chalet over 2012 President's day weekend. The place had everything we (4 adults, 2 kids) needed. The location in the Mittersill village is great with less than half a mile to Cannon lifts. Cort at Franconia Notch Vacations was very professional and made booking and stay problem free. The only issue we had with the house is the heating. Individual room thermostats do not work so some end up warm and some end up cold especially during the night. Nothing that an extra blanket won't fix but something to keep in mind if its an issue for someone. WE have stayed at Emmon's Mittersill Chalet twice now and really enjoyed our time. It's clean and has a great location for skiing and hiking. The interior of the house could be updated at some point, although I hope this does not change the great atmosphere. Except for needing a sign up sheet for the bathroom (jk!) we had a great time at Emmon's Chatlet. 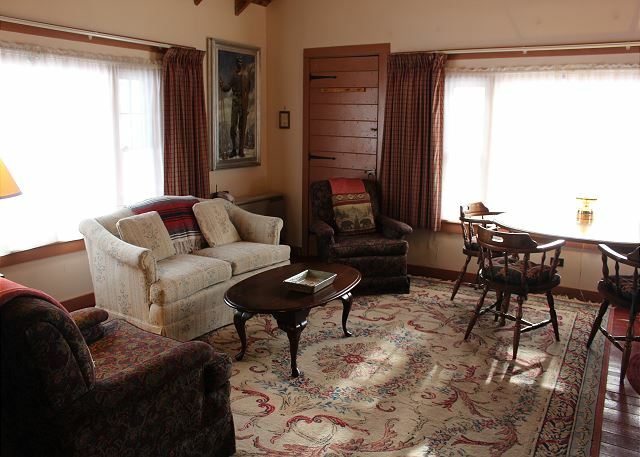 It is close to all the major trails, yet far enough away for a comfortable, private stay. The place was clean, the manager very helpful (they let us bring our cats along for no extra charge!) and the view of the stars at night was priceless. Definitely recommend to everyone. Thank you for reporting back. It is always most rewarding to us to know our guests have had a great time!! Thanks again. a kitchen without an exhaust fan, a shower with minimal water pressure, "green" wood in large sizes - almost impossible to keep going, even with starter sticks.. The Emmon's Mittersill Chalet is nestled in the Mittersill Village, which is practically a walk away from Cannon Mountain. The surrounding is anything but busy streets and loud traffic. You're surrounded by nature- trees and mountains in the far back. I was amazed at the size and the beauty inside the chalet once I stepped in. I was also amazed at all the amenities that was included, such as pots, pans, silverware, table condiments, and even some classic board games! The kitchen is big enough so you can do some cooking while you're there. The bedrooms were supplied with fresh linen for all guests. The Wi-Fi internet is a great touch. When it snowed one morning, we left to go out for a bit and by the time we got back, the walkway leading to our front door was plowed to our surprise. There's plenty of hot water and the shower pressure is very good. With the fireplace available for use and the heater, you'll have no problem getting through the coldest days. The staff of the rental agency is very friendly and courteous. I highly recommend the Emmon's Mittersill Chalet to everyone looking for an unforgettable ski vacation. A minute from Cannon and 20 min from Loon. Why stay at a hotel when you can feel like you're in a vacation home? Fanatastic cabin with a great location! Skiing down Mittersill at the end of the day was sweet. Thanks Cort!!! Glad to hear you had a great time Tim. It really is my pleasure when you guys tell me you found yours while staying with Franconia Notch Vacations! a guest from Tewksbury, MA does not recommend this vacation rental. The condition of the house was very old and smelly. The toaster oven was not working, nor there was coffee for the coffee machine. The house was very cold and the heater was not working properly. The house accomodates 6 people but one of the double bed is in the attic. The attic was so low that you couldn't even put a chair upright, it was miserable. This house has just one bathroom therefore ideally it should not accomodate more than 4 people. The maintanence was very poor,hence I would definately not recommend to anyone. Can't wait to ski through Mittersill wilderness back to the chalet someday. Thanks our stay was great. There should be a vaccum cleaner in the unit. Although there were 2, one was not working and the other was very old and hardly useable. Otherwise, a wonderful place to get away. The clean up after the last guest left a little to be desired. Needed kindling for the fireplace. Cristina O from Brooklyn, NY does not recommend this vacation rental. It was old, small and not well kept up. Dinning room table was missing a leg, master bedroom bed was unusually small and could not accommodate my husband and myself both in width and length (bed cannot accommodate anyone over 5'10"). No newspaper for starting fire, logs too big for fireplace, towels, cheap and small, overall, it appeared no one had cared about it in years and the chalet should probably be torn down. Thanks for the "truly honest review" Cristina. Ironically the couple that checked in right after your departure... loved the place. Different folks like different strokes I suppose. My best advice is to be sure to book early in order to get the best option available for the very popular Christmas New Years week. Thanks always for choosing Franconia Notch Vacations. Excellent house, perfect location, nice fireplace, warm! The only thing was that in the advertisement it said that there is a gas grill, but the grill was a charcoal one. For us it was better, as we like charcoal, but maybe you should change the line in the advertisement. Other than that it was a wonderful experience!!! Thank you for the clearification on the grill. We have corrected the listing and glad it worked out for the better. An electric kettle would have improved the facilities. we loved it there, the beds would of been alot better if they were a queen or bigger or even a full with a twin in one room and queen or king in the other. we would love to come back asd we are going up oct. 23 thru the 28th but we have to stay else where as the beds are not the right size sorry. Let us know if you have something else bigger bed wise please.